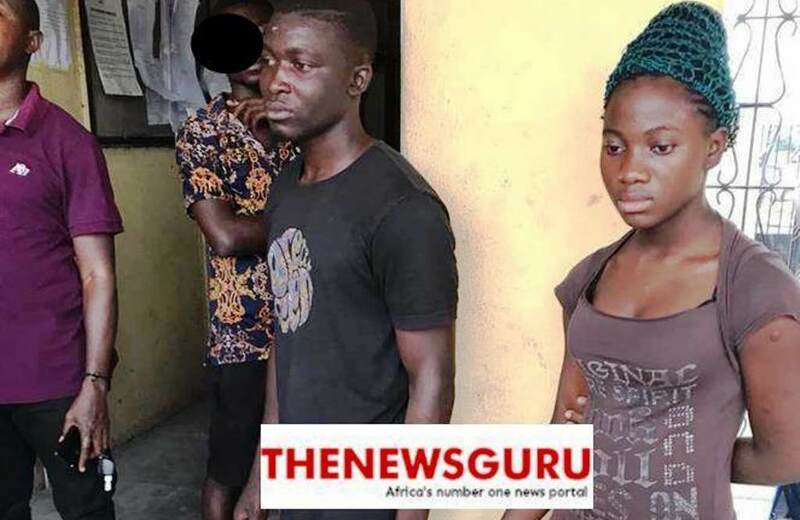 A domestic worker and her plumber boyfriend have been apprehended and handed over to men of the Nigerian Police Force (NPF), after preliminary investigations revealed that they were involved in alleged kidnap of 15-year-old Bella which they reportedly intended to use for money rituals. TheNewsGuru (TNG) gathered that the domestic worker known as Tope [Surname withheld] and her plumber boyfriend, Sunday [Surname withheld] allegedly connived and kidnapped the victim, Bella on New Year Day. 17-year-old Tope said she carried out the dastard act with 24-year-old Sunday, who is a plumber to Bella’s guardian, because he had promised her marriage, TNG gathered. Tope during interrogation said: “Sunday, my boyfriend called me on phone on the 30th of December 2018, saying he wants to be rich and that he is tired of wallowing in poverty”. She further said: “I asked him how he intends to become rich, knowing that he is a plumber”. “He then said he will do what his mates are doing to get money. “I then asked him if he wants to go into money rituals, but he said nothing,” Tope stated. “Thereafter, he convinced me that once he becomes rich, he is going to marry me. “He called me very early on the 1st of January to bring Bella outside the gate of our house, which I did,” she added. While explaining how she got Bella to Sunday, Tope said, “I woke Bella up and I took her outside in the guise of going to sweep the entrance of the house. “She succumbed and I left her outside with hope that Sunday would come to pick her. “I don’t know if Sunday came to pick her himself or if he sent someone to pick her”. In a chat with TNG, Bella’s guardian, whom Tope is working for, speaking on the incident, said that when Bella could not be found, they were compelled to question Tope, after discovering there had been communication between the plumber and her before and on the day of Bella’s disappearance. The guardian who reside in the Amuwo Odofin area of Lagos state said they had woken up with high hopes on the 1st of January 2019, getting set for their morning devotion when they found Bella was missing. “We had to beckon on Tope to go upstairs to call Bella for the morning devotion. “Amazingly, she wasn’t found and that was how she became missing for 3 days,” the guardian narrated. “She didn’t even confess until after Bella came back. When Bella came back, she was shocked. She was even crying. “I was thinking she was shocked that she has seen her, but later I realize that the shock was not about that. “It was about the fact that everything has been exposed,” he further stated. TNG gathered that Bella was miraculously found in the neighbourhood January 3rd looking shabby, without footwear. However, when Bella was questioned by her guardian about her disappearance in the night of her return, she could not recall anything, and then lost consciousness. “She cannot remember anything,” family sources who preferred anonymity told TNG. According to the guardian, she was immediately rushed to a hospital for treatment, where she is said to be recuperating. After hearing Tope’s confession, the guardian reported the case to the police in Festac town. “The case is still there at the Festac police station,” the guardian said. The guardian revealed that the police is also following up on one Alfa that Sunday took Bella to for ritual purpose. He said the police saw communication between Sunday and the Alfa, but that when Sunday was interrogated, he denied he doesn’t know anyone like that. However, Sunday later agreed he knows the Alfa, whom he took Bella to for the ritual purpose. “The police are saying that Tope is just 17, a juvenile, therefore, should be released on administrative bail. “I have to call the DPO and told him I don’t understand what his men are saying, that they want to release a kidnap suspect on a weekend on administrative bail on age grounds without proper investigation of the case,” he said. When contacted, the DPO, did not immediately pick TNG’s call nor returned our calls as at the time of filing this report. Meanwhile, the guardian told TNG that “Sunday could not say much because probably he has sworn to an oath not to reveal anything on the matter”. “If we didn’t find this girl, today, it would have been a different story. If the girl didn’t come back or we didn’t see her, we will be running helter-skelter, she will be sitting down here eating, and be asking, “Have you found her?” You will think she is on our side. “And more danger in it is that, if Sunday should finish with the rituals and the money comes, and Tope is still here, God forbid, he might want to eliminate Tope since she knows the secret. “They will say, one got missing, another one died, this pastor, what is he doing with people’s children. So, I really thank God. “We thank God that Bella is getting better at the hospital where she has been placed on admission,” the guardian stated.